An hour away from Haley’s home in California sits Pasadena, the home of the Tournament of Roses Parade. The Parade was founded in 1890 to showcase the mild California weather and has continued annually since, each year on New Year’s Day (unless it falls on a Sunday), the Parade is the lead entertainment prior to the Rose Bowl football game, this year a clash between the Oregon Ducks and the Wisconsin Badgers. But just to be clear, the Parade is not second fiddle, it actually began long before the football game was introduced. 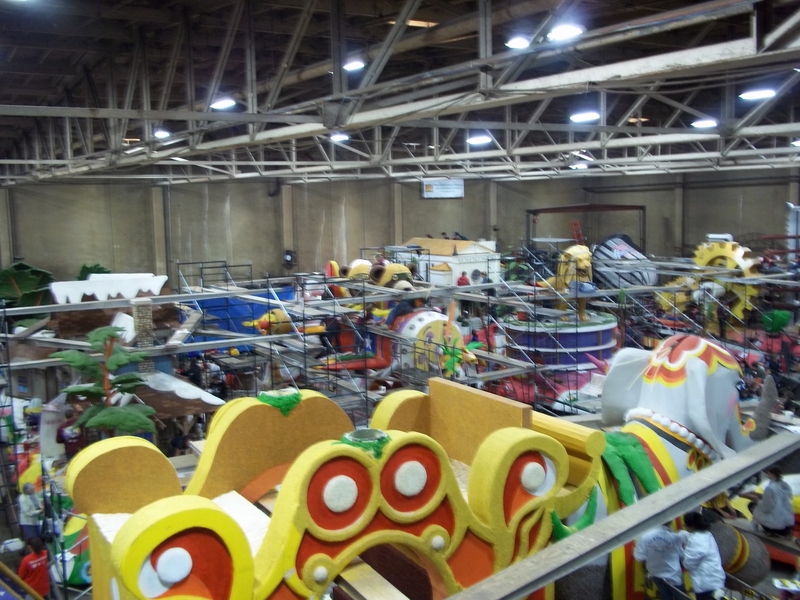 There are 45 floats being built for this years’ parade. Ten of those are going up in the Rose Palace, including floats for Wells Fargo, the Oddfellows, HGTV, Farmers Insurance, Lions Club, LA County Natural History Museum and the Lutheran float. The floats themselves are a wide variety of subjects, from a circus carnival to a full blown home, to dinosaurs that look right from the Mesozoic era, the theme is Just Imagine. The float we spent the day on includes a Bible with two doves carrying olive branches. Haley spent most of her day hanging out with Jesus, or at least a very good likeness of him. The float building has been going on for a year already, there is just one week left to complete the process. 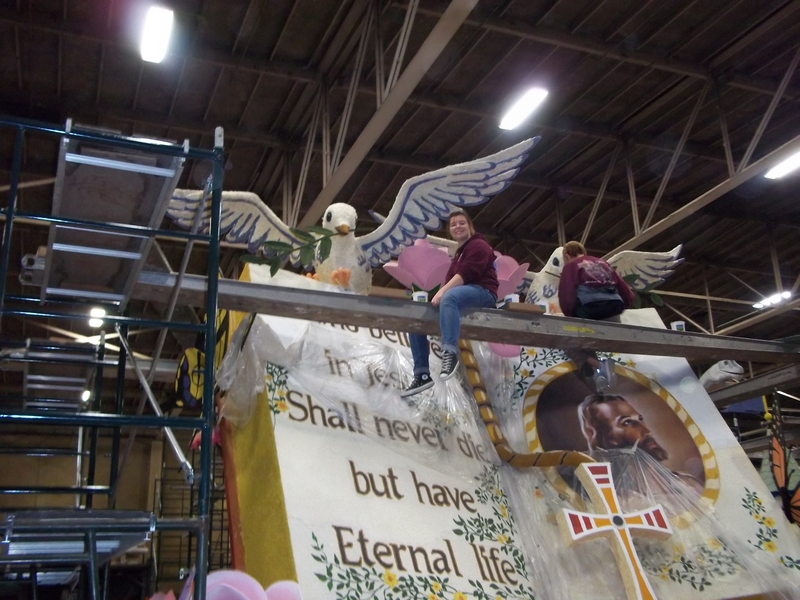 Each float ranges from $75K upwards, in materials and flowers, most of the labor comes from volunteers. We are members of those volunteer ranks this year. There are hundreds of people milling around our float barn, from all walks of life, from all corners of the globe, all have come together for the same purpose, to do something not everyone can say they’ve done. Our little band of renegades working on the Lutheran float today were a bunch of individual volunteers that joined together for the afternoon shift. There was Ernie from Fullerton, he’s an eye doctor; Nandra from New York City is a yoga instructor, Annette, now from Florida, is a bucket-lister, Carol from Hanford is a dentist, and Haley and I were there too. There was a family from Minnesota and a local guy, John, next year will be his 20th year as a volunteer. We are under the direction of Jenn, from Indiana and her sister, Mandy, from New Jersey. Most of us working together are new this year, everyone has a little bit different expectation, but for most, this is an experience they have looked forward to for a long time. For those of you thinking, “I’d like to do this” – you can. Just volunteer with PetalPushers.org and you too can have the opportunity to work really hard for the satisfaction of a job well done. If you are wondering what to expect, I’ll give you some clues over the next few days to prepare yourself. First, be one time for your shift and sign in. How you sign in is how you will be assigned inside the Float Barn, so if you are working with friends and family, sign in together. Petal Pushers must be in an appropriately labeled shirt, it doesn’t matter what year it is, but it must be official. They are available for sale right at the door. Third, sign up for the evening meal, Pizza Hut delivers a personal pan pizza for $3.50. Once all that is done, wait patiently for someone to call your name, that’s when the real fun begins. Your first task is likely to be cutting statice. 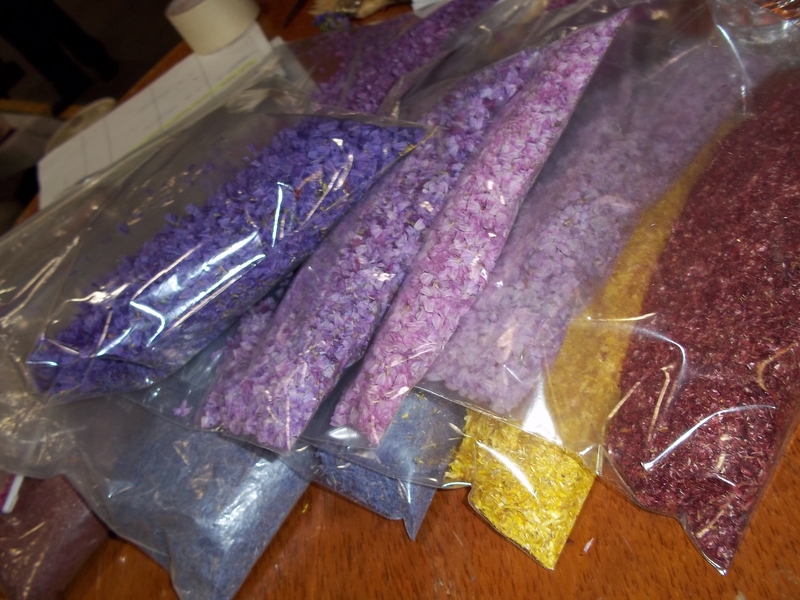 All of the flowers are dried and then cut off the stem to create color. Whole tables of people sit for hours cutting flower petals in to boxes. Thousands of stems and petals are cut in any session, plan on it, it is the lowest job on the totem pole – everyone starts here. This entry was posted in Uncategorized and tagged Rose Parade, Rose Pavilion, Tournament of Roses by Vagabond63. Bookmark the permalink.